We had it ALL to ourselves. Where the road dips, and had been washed out, there are now fords. The road is paved with open permeable concrete blocks. On either side, gabions. Wire cages filled with rocks. Beyond the road works, bare soil, but they mostly worked just on one side of the road. The Other Side is now lush and green. In time the gabions will collect soil and seeds. Already they begin to green over. Our first rain has begun to cut the new channel down to the stream, in the valley between us and the distant mountain. Clear cold water, which will find its way down through and over the rock. To the Voelvlei dam for the city of Cape Town. This is both a water catchment area, and a wilderness area. Fynbos is adapted to fire. Above ground, sculptural dead limbs. The Protea bush is a dead skeleton, but from the roots comes the ‘next generation’. After the fire, the seedheads open and scatter billows of seed. 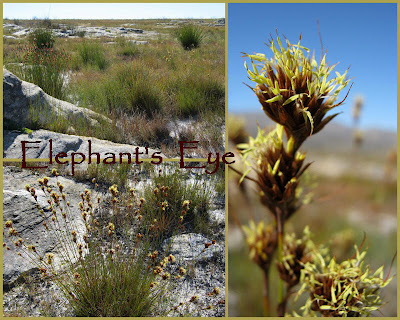 Many fynbos plants are adapted to only germinate their seed after fire. When there is space for a seedling to stake a claim. And on the ground humongous vibrant green growth. The revegatation is gold and maroon and silver. Restios and grasses have reclaimed their world, before they get shaded out by Protea bushes. Nerine or Hessea cinnamomea? Erica sp. The air is like champagne. Our mediterranean climate doesn’t bring us crisp revitalising air, but up on the mountain, is different. Here there will be frost and snow in winter. And it’s pink champagne, for all the flowers are pink today. Oxalis, (Nerine or Hessea cinnamomea? which flowers prolifically after fires, but not in cultivation), Erica and Protea. 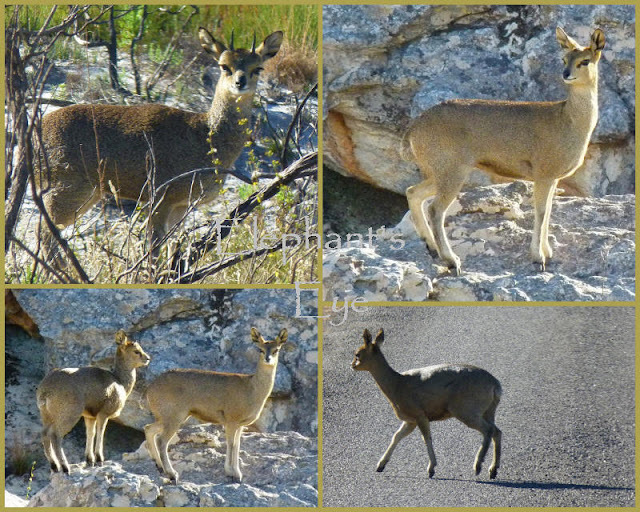 See how the klipspringer dances on tiptoe? We used not to see animals here, but today we saw 3 klipspringer, a grey rhebok and a troop of baboons. Teenagers and little bitty babies, with toddlers weaving in between. One mother trying to coax her dead baby back to life. And the last member of the troop. Walking on his hind legs (like us) because his front legs seemed to be just stumps. Trailing behind, unable to move as fast as the others. Here, one of the young males, on scout duty in the Groot Winterhoek Wilderness Area. Open to visitors again. We who live with a climate and plants, as in Crestridge San Diego, where fire is a part of the cycle of life, know both the horror of waiting for the flames to die, the smoke to disperse, the embers to cease glowing, even underground. And the joy of nature’s response to the first grateful gentle rain. 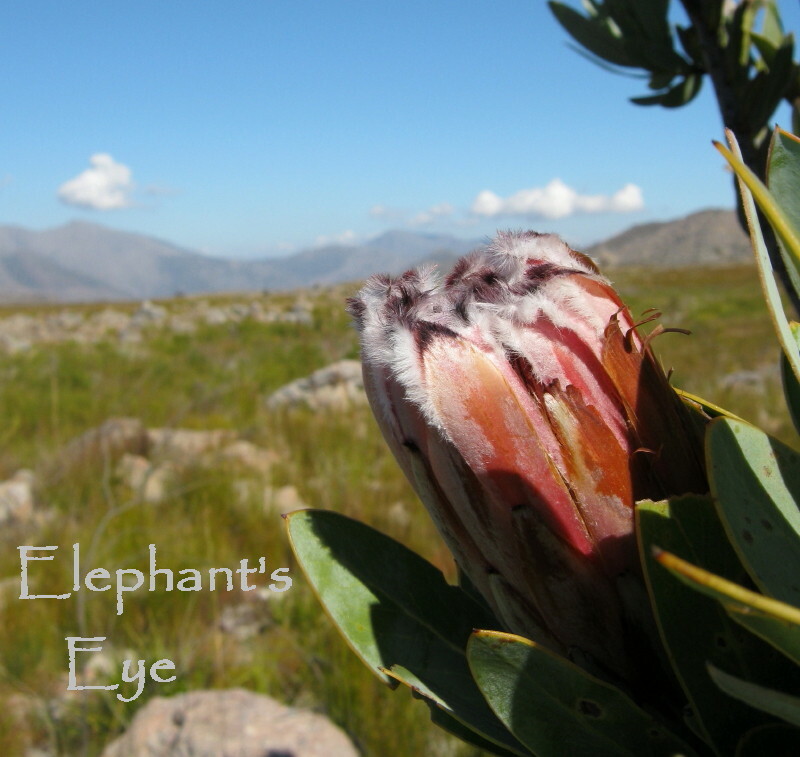 Come up the Dasklip Pass and thru the Berghoff Protea farm to see. The young baboon sentry is a hauntingly beautiful photograph. A couple of stunning flower and vegitation pictures really doing justice to the area. 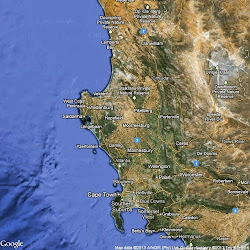 Is this one of the areas that is covered as a World Heriateg Site due to the status of the Cape Floral Kingdom? 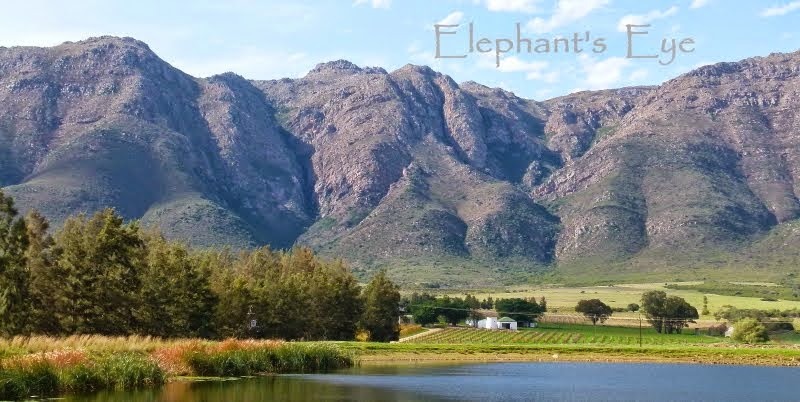 If so, we have the Baviaanskloof on our doorstep that is also covered by the Cape Floral Kingdom's UNESCO status. Firefly - yes we went to Baviaanskloof. 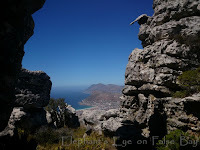 Still getting readers for the post on the Cycad trail. Hi Diana. 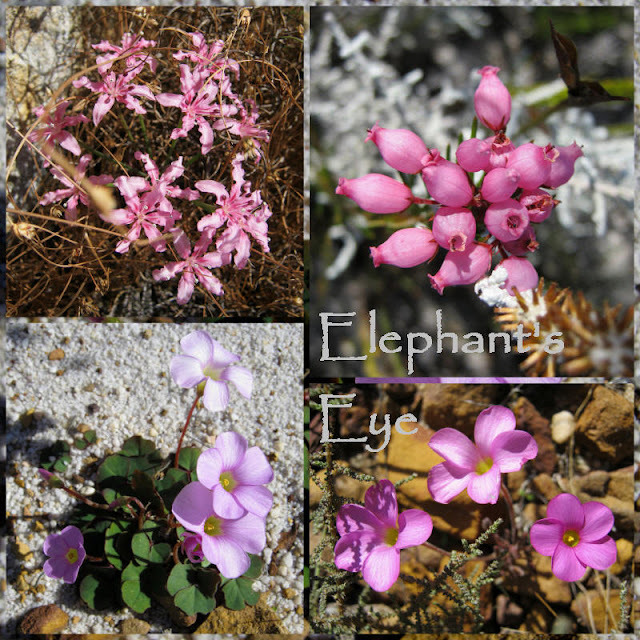 Some of your photos, such as Oxalis sp. or Erica sp., are remarkably similar to the same gender that exist in the mediterranean, taking into account the great distance and a common ancestor, are actually plants that move slowly migrating to the good weather up and down. It's funny and exciting at the same time. Lovely post--the pictures and descriptions are great and make me wish I was there. I love reading about things that we just don't get to see here in Wash. DC, especially this type of World Heritage Site. Thanks for sharing! I never thought about fire being a key element in the cycle of life. I've never heard of World Heritage Sites either, your post has inspired me to google the others. Firefly and b_a_g - you sent me in search of the PS I added. 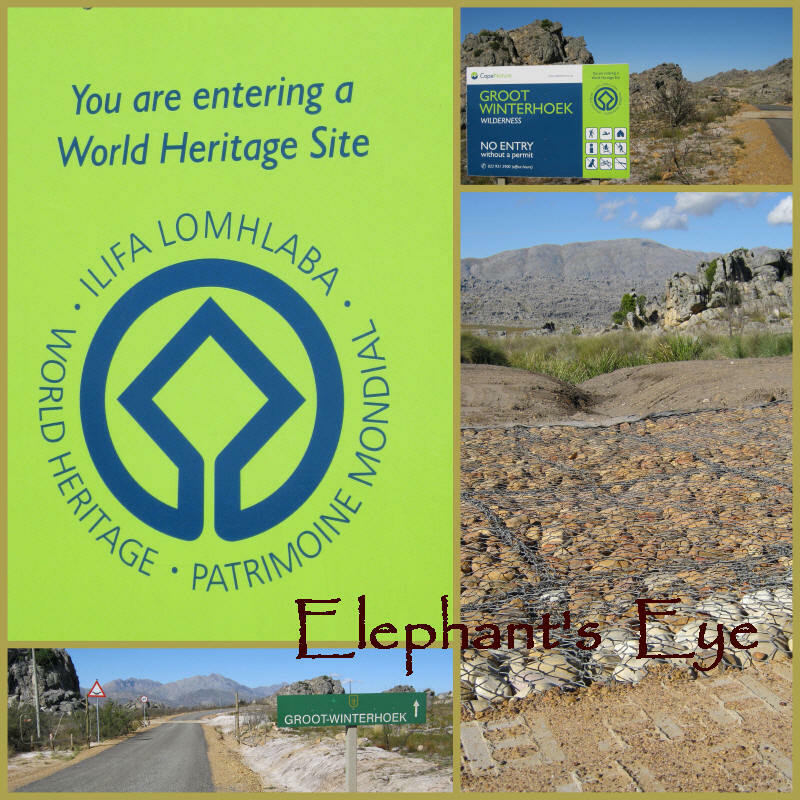 Link to UNESCO WHS. Beautiful area. Glad to see it has some protection under the WHS label. That white trail is very, very striking. I wish I could be walking along it now. Never thought I'd want dryness over damp, but after the wettest spring in 150 years, your photographs are a welcome sight. Definitely need to plan a trip to this one. 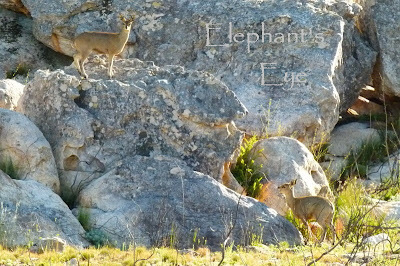 Love the Klipspringer on tiptoe. Hi EE, this looks great! 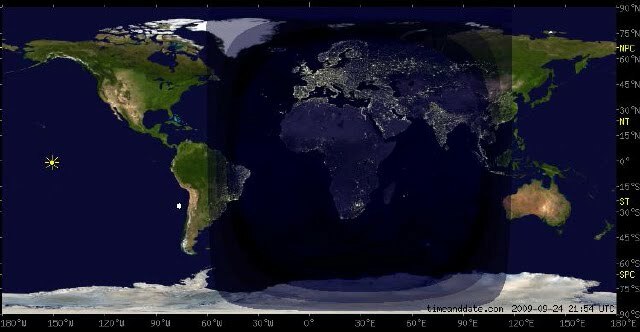 How far is it from Cape Town? What a beautiful place! Your words are so descriptive, photos so fab! 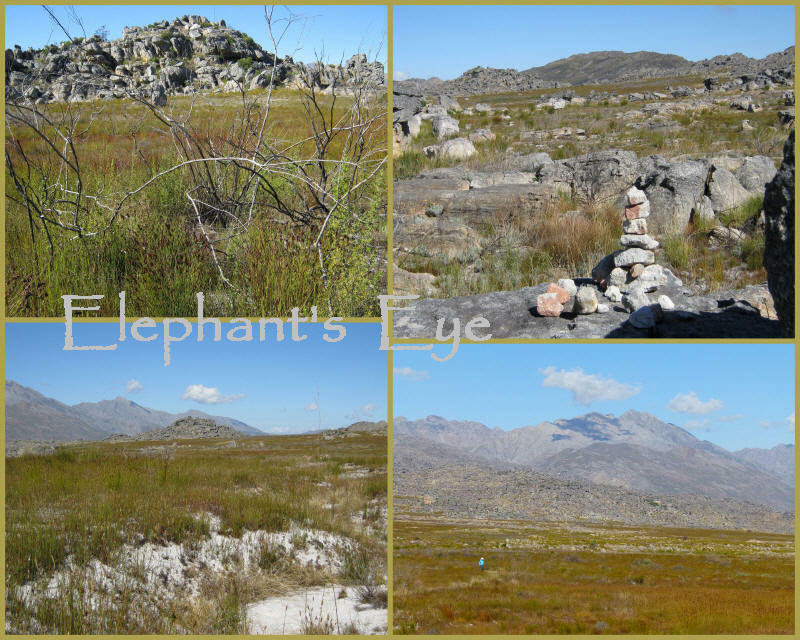 Sprig - Groot Winterhoek is 170 km from Cape Town. 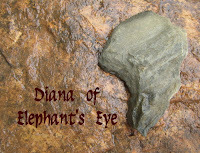 Oh, what a lovely opening to this post, Diana, and to your delight in the way the wilderness has renewed itself. I've always heard that fire could be healthy for an ecosystem but never knew that plants actually depended on it in that way. The colors and textures in the fynbos are beautiful--it's easy to see why you love it so. Stunning blog, EE. Ungardening must be an absorbing pastime:-) The tippy-toe-dancing klipspringers remind me of my kittenhood when paws had springs and sideways dancing was purracticed daily. Left feeling giddy with all that pink champagne, and your accompanying words touring this area of natural beauty. How lovely to see Nerines in their natural habitat. The Erica surprised me too - associate it with grouse moors rather than the fynbos. A beautiful post. I'm imagining air like pink champagne and drinking it in! We in Austin, Texas, are in fire season too. So far we've avoided any huge wildfires like they get in California and west Texas, but I fear our day is coming. It is nice to see how a landscape like this one comes quickly back to life after a fire. That was a very enjoyable post. If only it were so easy to head down your way and enjoy all that you have been sharing. I guess I will enjoy vicariously through you for now. Was the area closed for long? I am glad it is accessible to you again and that animals seem to be repopulating the area. Such a stunning part of the world! Your photos and description of the baboons are poignant. A mother trying to coax her dead baby back to life? I am a neonatal nurse, and tears are in my eyes. Thank you for the tour. World Heritage Sites cover such an extraordinary range of places, from designed landscapes and archaeological sites, to wonders of the natural world, like this one. Like other commenters, I found the photo of the baboon sentry haunting, and was fascinated to hear about the essential role fire plays in this landscape. It is all so different from Paris!! 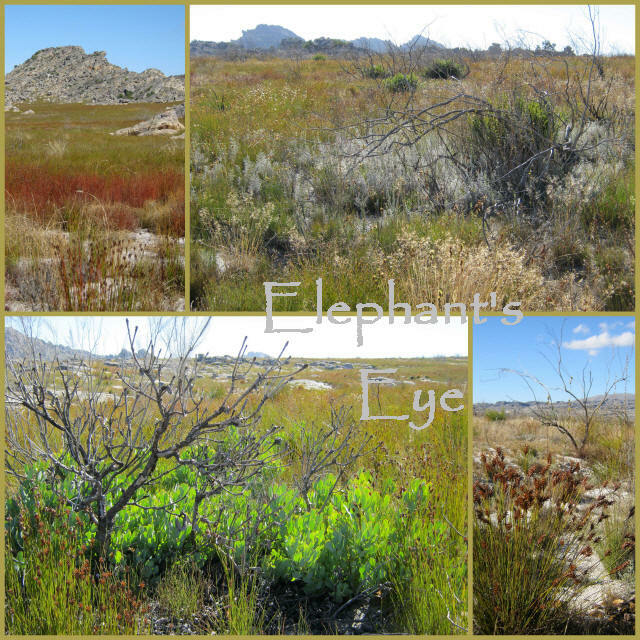 Laura/Patiopatch - fynbos has over 650 species of Erica. We take our biodiversity seriously. Bom - they last let us in the Wilderness Area, not last November, but the one before! Deb - sadly it is very obvious how the baboon mother grieves for her dead baby. what a wonderful post, we love making our gardens, but to visit such special conserved landscape and see animals in the wild is a real thrill. Thank goodness the road hasn't spoiled the wilderness. Thanks for the mention! I'm curious whether the Fynbos tends to burn frequently. Our similar-appearing chaparral habitat copes fairly with being burned every several decades, although human intrusion and introduction of more flammable weed species has accelerated the frequency of burns and has threatened to convert one habitat into another--or into more fire-adapted invasive species. James - yes, snap. Invasive alien Port Jackson wattle, eucalyptus and pines blaze too hot for the fynbos seeds. Fynbos does need to burn, but not as often as idiots discarding cigarette ends, or arsonists, 'think'!